Vinyl Banners is rated 4.6 out of 5 by 72. Rated 5 out of 5 by Lynn from Quality The banner is of even nicer quality than I expected! Rated 5 out of 5 by ABUMC from True to design and description Bought for our church. Sturdy, well made. No surprises. Rated 5 out of 5 by regular customer from Really good quality banner for great price Our banner came on time, looked great, and we paid a great price. Thanks for the great service! Rated 5 out of 5 by Greg133 from Great service! Excellent assistance from support staff, and a beautiful, durable print. Vinyl banner printing gives you a ton of flexibility for any event, even outdoors. Custom banner printing is the go-to solution for advertising at trade shows, conventions, real estate developments, and outdoor political and business advertisements. But thanks to their wide range of options they work well in all these situations and more, such as in permanent exhibits, as decor, for smaller personal events such as birthday parties, or as a business sign for pop-up stores and food trucks. 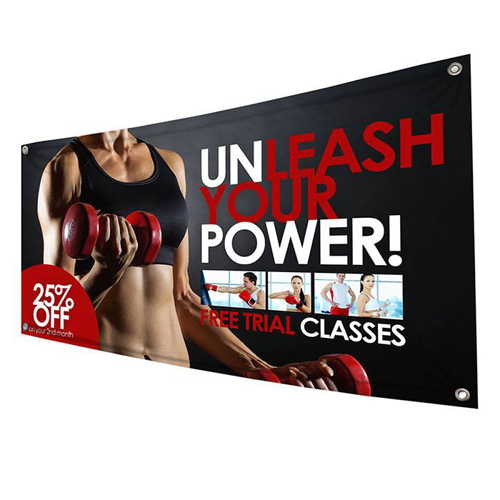 Vinyl banner sizes range from 3’ x 2’ to 5’. x 10’, making them suitable for any of the previously mentioned applications. Vinyl banners come in durable 13 and 15 oz. white vinyl, as well as a lightweight 9. oz mesh vinyl. Use the heavier grade white vinyl stocks for long-term displays and the lighter mesh vinyl stock for lighter banners that are designed for windy conditions. All of our vinyl banners are water resistant, and wind slits can be added to relieve wind stress as well. Mounting options include grommets and pole pockets. Grommets are metal eyelets that let you thread ropes or hooks into your banner, while pole pockets are narrow compartments for sliding poles into for easy hanging. To print vinyl banner designs, simply upload your artwork, or use our design tool. You can also use our banner template signs in both horizontal and vertical orientations to ensure that your artwork is in the safe zone and that all bleeds and trims are accounted for. Be sure to check our banner order pages for incredible deals and custom banner printing discounts. Read this article on banner sizes to learn more about the which design specs will best suit your needs. Start vinyl banner printing today.